Kenyan style Chevdo or Kenya Chevdo / Chevro is sweet, spicy and incredibly tasty and you must shove a handful in your mouth at least once in a lifetime. I guarantee that you'll never give up on it. 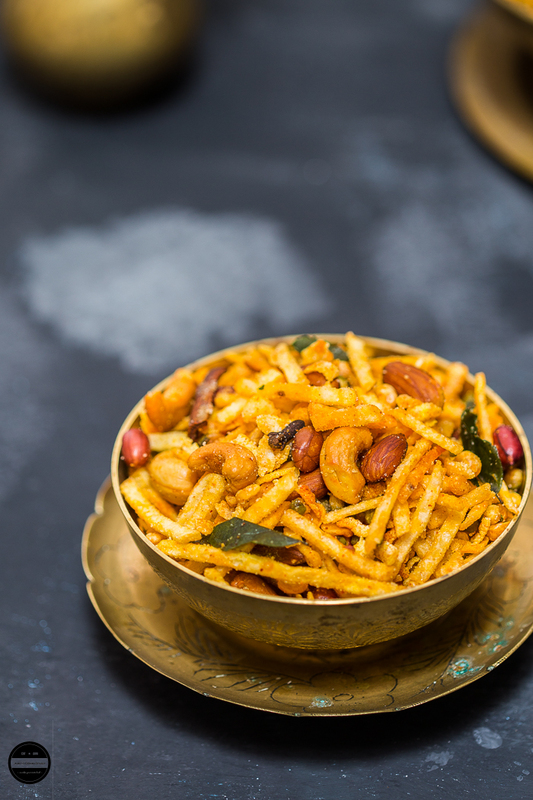 This savoury snack is crunchy and definitely full of flavours. 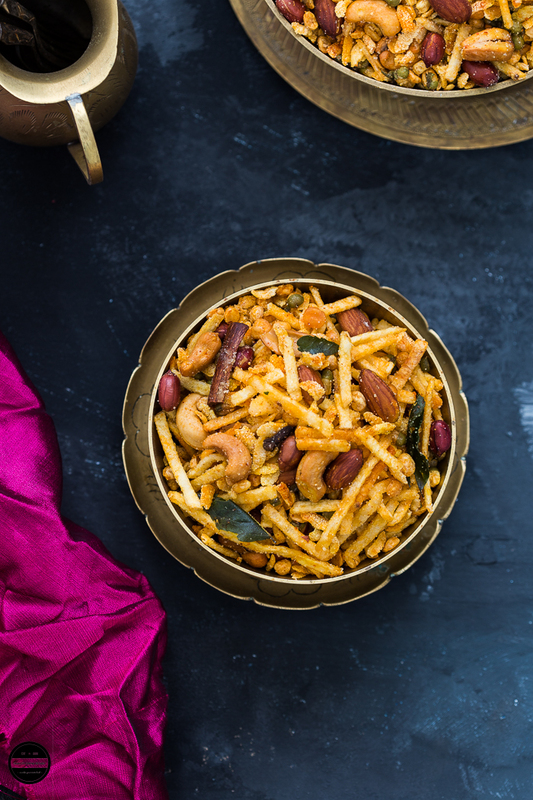 It's a delicious blend of deep fried potato crisps, beaten rice, fried beans, lentils, nuts and some basic spices. It's a cliche that Mother in Laws and daughter in Laws relationships are mostly tenuous one, but this has been proved wrong about my relationship with my Mother in Law. When I met her, I knew we will get on so well, although I did not spend much time with her as she passed away after some months since I met her, but the short time that I spent with her are full of good memories. She knew that for a young girl like me it was very hard to settle in a foreign country, she supported me in every way, e.g. my thoughts and ambitions. We really had a great time cooking our favourite dishes together, and I really enjoyed her style of cooking which was very different to my mum's cooking and had many African influences. My favourites being Kasoli and Jugu nu Saak ( Sweet Corn and Peanut Curry) , Mogo ni Bhaji ( Cassava stir-fry) and Matoke nu Saak ( Ugandan Raw Banana Curry). In just a couple of hours, we prepared a big batch of Kenyan Chevdo, and let me tell you that it turned out absolutely delicious and has become an all-time favourite as much as my mum's Fried Poha Chevdo'. Kenya Chevdo or Chevro, is one of the most popular snack items amongst all the British Asians, especially who grew up in East Africa and migrated in late 60's or early 70's to the UK. It's a favourite item of my husband, he can't get enough of it. It is widely available in the Indian sweet shops but also many older generation of British Asians make this at home and some families supply this unique Kenyan Chevdo to their customers as it is made in a special way. Since I learned to make Kenya Chevdo from my MIL, I prepared it once almost two decades ago, then I misplaced that piece of paper which had the recipe scribbled down. We were so disheartened and missed this actual recipe. Our cravings for this led us to the sweetmarts but disappointingly it was no way near the homemade one. I also asked Google (Maharaj) for a decent Kenyan Chevdo recipe but none of the results that came up were even worth considering to waste my ingredients. Some weeks back British Gas came to replace all the meters, and guess what! The engineer handed me, my beloved piece of paper with the missing recipe. Happy days! It was stuck behind the meter all those years in the cupboard under the stairs. Husband was so delighted to see this chevdo being made, his words were: this sight and smell takes me back to East Africa and reminds me of my mum. The taste, colour and the aroma of chevdo is exactly the same how my mum used to make and he showed his appreciation. Kenyan or Kenya Chevdo is a delicious mix that is a very popular snack amongst all the British Asians. It's Vegan and a tasty snack prepared with various mixture of dried and spicy ingredients such as lentils, nuts, beaten rice and spices. On a previous night soak moong beans and chana daal separately in clean and cold water. In the morning discard the water and pat dry moong beans and chana daal with the kitchen towel, leave it aside. Dry the potato sticks with a kitchen towel and leave it on a new kitchen towel. 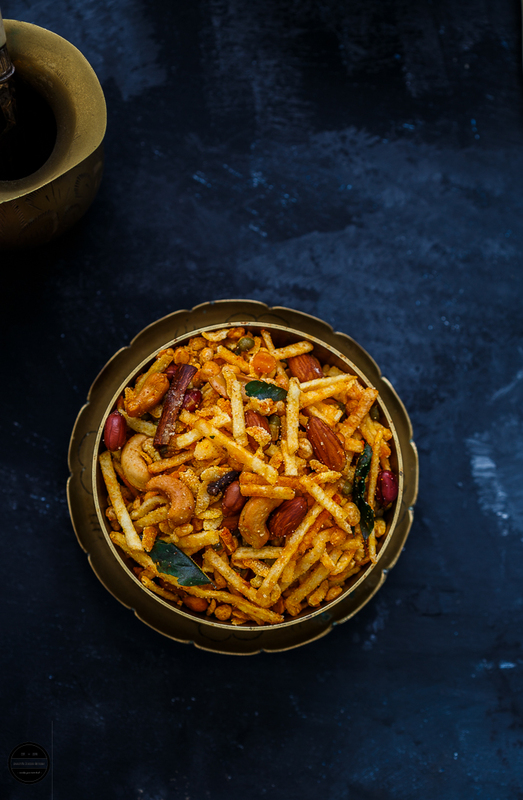 Heat the oil over medium heat and fry cinnamon and cloves, then fry green chillies and curry leaves and put it separately aside on a plate. Then fry the potato sticks until crunchy and crispy. ( It should not burn ) After potato sticks are done, fry chana daal and moong beans until nice and crispy. Now fry the nuts, followed by beaten rice. Keep everything in a big bowl or a plate. Now gently start mixing everything, and first add turmeric powder and mix well. Then add red chilli powder and salt. Again keep mixing gently and then add sugar and amchoor powder. Mix everything so well and then add green chillies and curry leaves. Mix again and let it cool completely. Once cooled completely store in an airtight container. 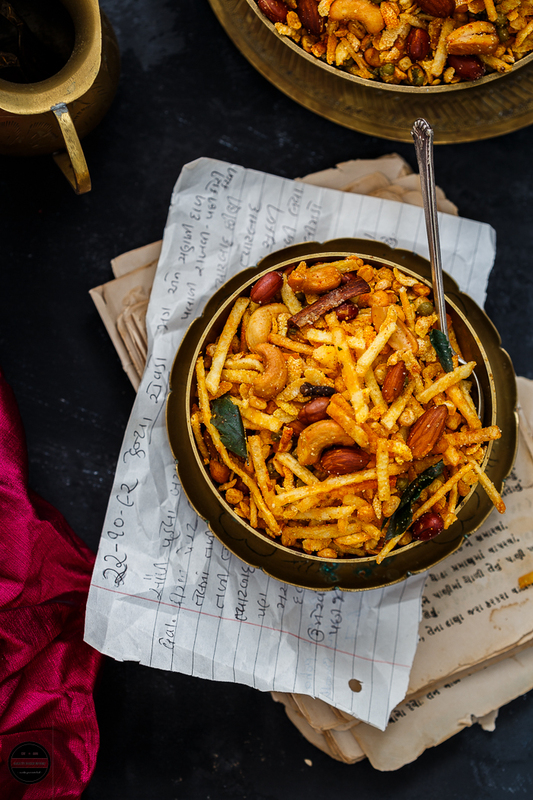 If you are pressed for time, you can use ready made potato sticks (Batata Katri julienne style), masala Channa Daal and Moong Beans and still you can prepare this recipe. You can adjust the spices and sugar in this recipe according to your taste. hi jagruti...this chivda looks lovely! lovely pics as usual too............finally managed to set up my page too.thanks for ur help! Thanks Farah! I am glad, I was able to help you. Chivda looks lovely...I had the opportunity to try kenya chivda when I visited my In-laws place...Thanks for sharing the recipe..
Glad you enjoyed this chevda. The chevdo looks so tempting right now what I want is a bowlful of this chevdo a glass of masala chai and a cosy corner to read a book and I am done, missing these homemade chevdo after I left Gujarat, will try your lovely recipe soon. Thanks Soma! Sounds a good idea :) let me know how you like it. That sound awesome.. Potato fries in this chevdo steals my eyes.. You have just nailed it perfectly.. It is so heartening to get lost piece of paper - it has so many memories attached to it. Now that you have the recipe on JCO, you wont lose it. These chevdo are calling out to me.Perfectly done and what a pair they will make with adrak wali chai! So glad you were finally able to find your MIL’s recipe. I know the feeling of losing a recipe that is handed down. Thank fully now you have it documented for all of us to peruse too. So a big thanks to you for that. This look so delicious and coming with a heritage link it must be awesome. I love to try this chivda only time involved is tooooooo much. Maybe when I am on leave. Classy post for chevdo, Can finish the Bowl of shaved with sambar rice.. Your pictures are too perfect and you nailed it..
looks crunchy and full of flavored fried snack. Perfect for evening tea time. Really sweet of your MIL and glad you finally able to found the treasure :) Chevdo looks stunning and I am sure that this is dangerously addictive ! Great tea time snack! Looks chatpatta :)) Nice clicks. Omg, such a fabulous chevdo, seriously its really a treasure to find these sort of dishes now, thats really sweet of your MIL and now we got a fabulous snacks to make anytime. Thanking you for sharing this delicious crispy beauties. So glad to know that after all you found the original hand written recipe and no wonders it was stuck there, it happens with me sometimes some valuable papers I find stuck behind things I won't even imagine. Love the recipe and pictures. Love the use of potato fries, its amazing!!! 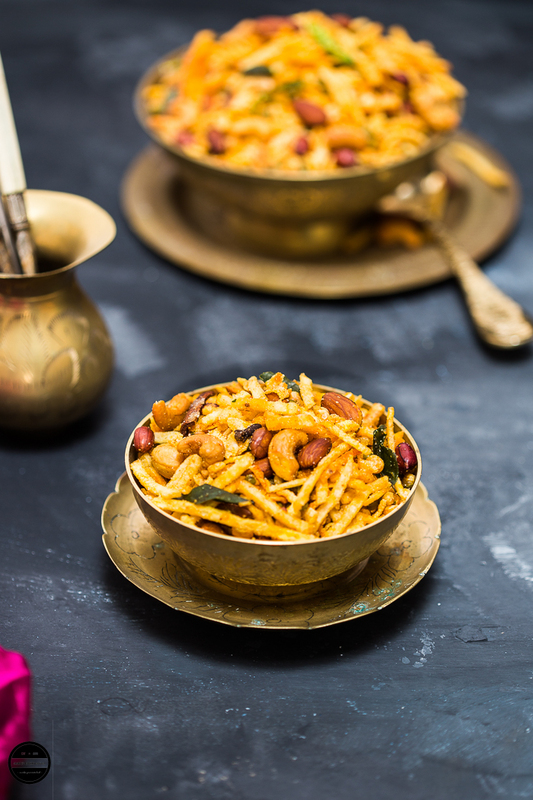 Love this chivda, perfect partner for Tea or evening Munch .. loved recipe. Loved reading about your story about relationship and u and MIL. Very sweet. well after reading the recipe your Notes helped me a lot to relax that I can make this with some ready made ingredients. I like all your chivdo recipes. Thanks Bhawana! Hope it turns out great for you! Lovely post Jagrithu!This chevdo sounds so addictive. I too learnt quite a few dishes from MIL and she was so happy to share the recipes. My style of cooking is totally different from her ways yet I wanted to try them out and even earned her appreciation! And those handwritten recipe notes are forever wandering around the house and my maid now understands how important they are to me, so keeps them all safely on my table.And so nice that you found your treasure after so many years! When there are DIL's like yourself, who worries about having tiffs and arguments with MIL's? A relationship takes 2 people to grow and nurture. Each one is expected to do their bit and adjust too. That is the simple logic of life and every relationship that we come across during the course of our existence. The fact that she accepted you as a daughter and understood you speaks volumes of her good nature and secondly, you also accepted her and learnt from her. It is not easy to do that. Written recipes are such a treasure and I am so glad that you have that piece of memory with you now to pass it down to the next generation of great cooks. Chevda is looking super duper and I am so in love with the beautiful write up. Cheers! Awesome Post Jagruti! I got emotional while reading your story. Hats off to you for keeping that piece of paper safely for so long. You are a great Daughter in law. I ma sure your MIL Would be so happy to find you.Your pictures are too perfect and every time I visit your website I get mesmerized.